This weekend, my wonderful partner, Scott, and I celebrated our five-year anniversary. After I opened my present, I asked what had led him to the Oxford English Dictionary. He had done a search for the best gift for a writer, and what came up on all the top ten lists of best gifts for writers? The OED. Chuck Wendig also recommends Neil Gaiman as a perfect gift for your writer friend. I can’t disagree. Right below Terribleminds was, in fact, a gift store for writers. Thank goodness Scott didn’t shop there. Know what I don’t need? A typewriter key necklace. Please, people, stop destroying serviceable typewriters to make kitschy baubles out of the keys. I also don’t need a mug with Shakespearean insults. If you give me one, expect to be called a fustilarian yourself. The Loft Literary Center suggested a subscription to the OED online–not quite the same, is it? They also recommended a t-shirt that says, “Careful, or you’ll end up in my novel.” You can do better than that. I don’t know what lists Scott found, but he done good! Have you seen the OED? Now that is a dictionary! OK, Scott did not buy me a first edition set. We’d have to build a library just to house it. I am now the proud owner of a 1971, two-volume, Compact Edition of the Oxford English Dictionary. How does one fit all the words in the English language as of 1971–and let’s face it, all the best words were around by 1971–into only two books? Photographically reproduce the pages at one-quarter of their original size. That’s right. My dictionary has four pages on every page. Which explains the first part of my gift. That afternoon Scott snuck out on a secret errand. I spent the afternoon guessing. He stepped out to buy a card. He was getting me a nice scarf like I asked for, and boy would he need some luck to find one the day of. He was picking up gourmet chocolates and wine…. He came home and went straight to the dark room. I heard the pssht! pssht! of compressed air and thought he was dusting a framed image. He had one of his photos framed and had to pick it up. Obviously. My gift was not the shape or size of framed art. In fact, it was in three parts. The first part, which was oddly triangular, turned out to be a magnifier. I looked at it and said, “You went to Ax-Man and got me a magnifying glass.” He tried to deny it, but I was onto him by then. I picked up part two of my gift and said, “You bought me a large book with very very small print and a magnifier.” Again he tried to deny it. 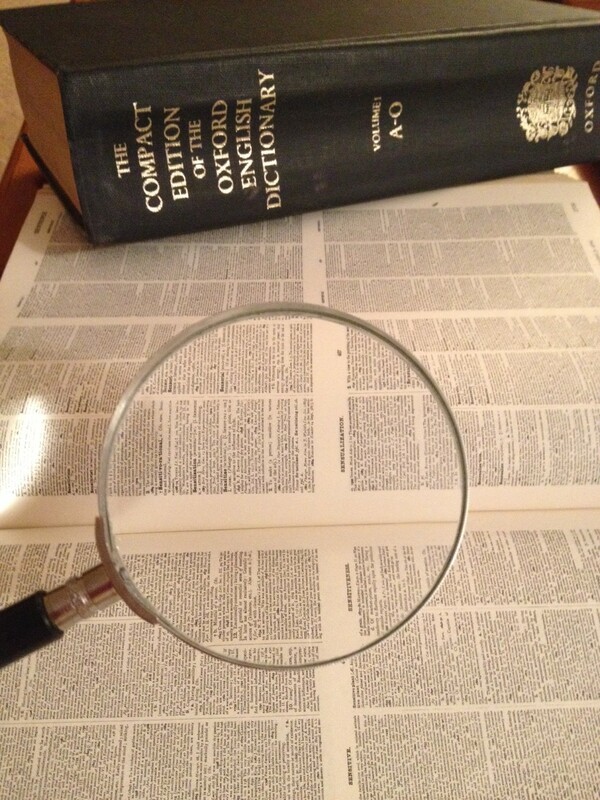 With my 5x magnifier I can just about make out the words. Seriously. I’m going to need a much bigger magnifier! Fankle: to tangle, entangle; to entrammel (a horse, etc.) with a rope; hence, to get fankled: fig. to lose the thread of a discourse. Wonderful!!! Just curious, what’s the copyright of this edition? It’s a 1973 print of the 1971 edition.